All applicants must have a letter of recommendation submitted with their applications. Download the form by clicking here:American University of Armenia Peer Mentor RECOMMENDATION FORM2019 . 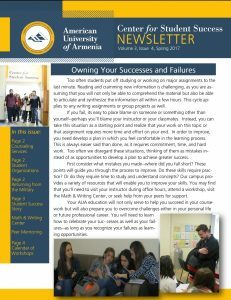 The letter should be submitted to the Center for Student Success either via email: mmikhaylova@aua.am or in a sealed envelope and delivered to Room 001N, Student Union. Please log in with your AUA credentials and complete the Google form. Submitting your resume via email: mmikhaylova@aua.am is optional however, highly encouraged.